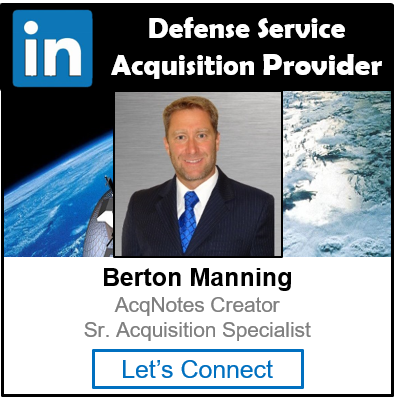 The Systems Engineering Plan (SEP) is a living document that details the execution, management, and control of the technical aspects of an acquisition program from conception to disposal. The SEP outlines how the systems engineering process is applied and tailored to meet objectives for each acquisition phase. The SEP captures a program’s current and evolving systems engineering strategy and its relationship with the overall program management effort. The SEP should include the process and criteria for updating the document. The SEP is updated as needed to reflect technical progress achieved to date and to reflect changes in the technical approaches stemming from the findings and results of the technical reviews, program reviews, acquisition milestones, or other program decision points. The SEP is updated and submitted for Milestone Decision Authority (MDA) approval at each program milestone. A draft update is due for the Development RFP Release Decision Point and approved at Milestone B. The purpose of the SEP is to help program technical managers develop their systems engineering approach—providing a firm and well-documented technical foundation for the program. A rigorous technical planning process forces thoughtful consideration and debate, allows for integration and coordination of technical activities across all levels of management, and results in a sound systems engineering strategy commensurate with the program’s technical issues, life cycle phasing, and overall objectives. Program Requirements: The SEP should define how the program will manage all requirements (statutory, regulatory, derived, certification). Technical Staffing and Organization Planning: The SEP should show how the program will structure and organize the program team to satisfy requirements. Technical Baseline Management: The SEP should establish a technical baselines approach. Technical Review Planning: The SEP should show how the program will manage the technical effort, including the technical baselines, through event-based technical reviews. Integration with Overall Management of the Program: The SEP should link SE to other management efforts, including the Acquisition Strategy, test planning, sustainment planning, Configuration Management, Risk Management, and life-cycle management. The Systems Engineering Plan (SEP) is not a Systems Engineering Management Plan (SEMP). The SEMP is developed to manage the development of a system by a contractor. Its written in response to a government SEP and provides unique insight as to the application of a contractor’s standards, capability models, and toolsets to the development of a system. 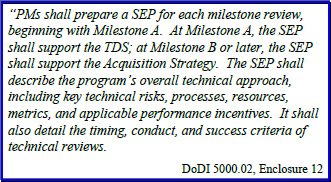 The SEP should be established early in the program definition stages and updated periodically as the program matures. Only by starting systems engineering processes early and monitoring them through the life cycle can programs effectively manage cost, schedule, and performance.